I thought healthy eating only consisted of grilled meat and steamed vegetables which was convenient because that was as far as my cooking skills went at the time. Being half Asian I missed my staple food, rice! I sucked it up as I thought it was necessary in order to succeed and reach my goals, until one day I learned that we need carbohydrates! It’s a confusing game right? Low carbohydrate foods are always promoted to us as healthy so we start to have a perception that all carbohydrates are evil, but this is far from the truth not all carbohydrates are created equal and we actually need complex carbohydrates in our daily nutrition. So I looked for a rice substitute and came across quinoa, I love quinoa as it’s easy to cook, it’s delicious and I can substitute it for white rice and also gluten filled flours. 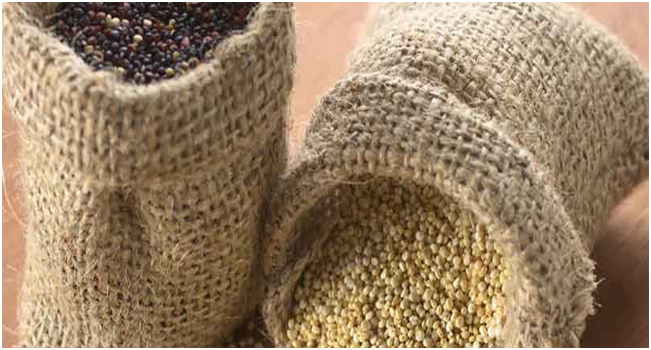 Quinoa seeds provide all nine essential amino acids making it a complete protein. Quinoa has been gaining popularity because it’s gluten free, high in protein and in comparison to grains it contains almost twice the amount of fiber. Foods high in fiber and proteins help digestion and your body’s ability to regulate your blood sugar. Quinoa is ranked 35 on the glycemic index which is relatively low and similar to most vegetables. The glycemic index indicates how carbohydrates affect your blood glucose, because quinoa has a low glycemic index this means that you avoid spikes and dramatic falls in blood-glucose so you get a much steadier stream of energy, therefore reducing your risk of heart disease and other chronic diseases that are implicated by blood-glucose fluctuations. Quinoa is rich in magnesium, manganese and iron. Magnesium helps to relax blood vessels and therefore eases migraines, it may also may reduce Type 2 diabetes by promoting healthy blood sugar control. Other health benefits of magnesium include transmission of nerve impulses, body temperature regulation, detoxification, energy production, and the formation of healthy bones and teeth. Manganese is a mineral naturally occurring in our bodies in very small amounts, it’s a powerful antioxidant that seeks out the free radicals in the human body and neutralises these damaging particles, thereby preventing many of the potential dangers they cause. Iron helps keep our red blood cells healthy and is the basis of hemoglobin formation. Iron carries oxygen from one cell to another and supplies oxygen to our muscles to aid in their contraction. Iron also increases brain function because the brain takes in about 20% of our blood oxygen. 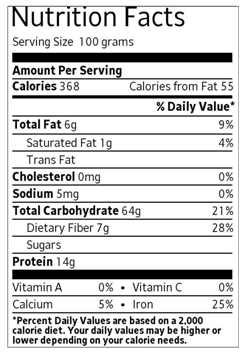 Below is the nutritional data for 100 grams of uncooked quinoa.